“At 2.5’’ shorter than our DCS380 cordless reciprocating saw, the DCS387 not only allows the user to get into tighter areas, it also provides more control than the DCS380,” said Dave Veprek, product manager, DEWALT. Along with its compact design of only 14.5 inches and weighing only 5 lbs, the user has better cutting options thanks to DeWalt’s exclusive 4-position blade clamp. A 4-pole motor provides up to 2,900 SPM with variable speed control and a stroke length of 1-1/8-inch. Other features of the DCS387 include an ergonomic handle with a soft grip and a built-in LED light that illuminates the cutting surface and the work area. 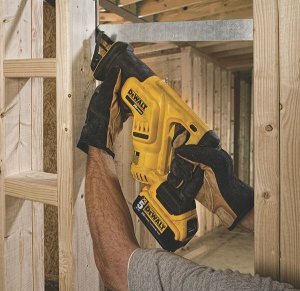 The DeWalt DCS387 20V Max Lithium-Ion compact reciprocating saw will be available in October 2014 as a bare unit (DCS387B: $129.00) or as a kit (DCS387P1: $259.00) that includes a bag, a DCB205 5.0 Ah Lithium-Ion battery, and charger.